I love a good statement coat, poncho or cape. 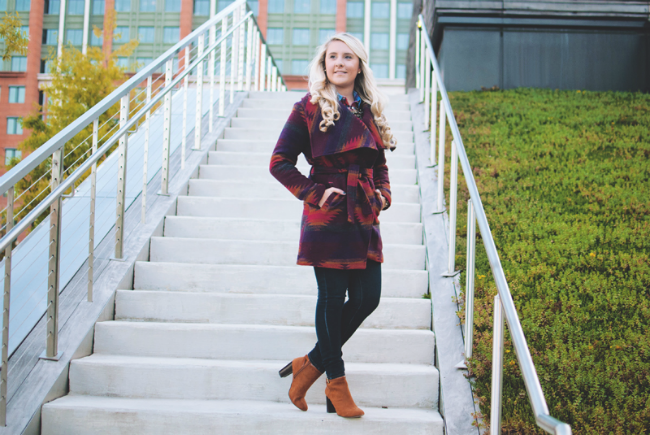 Fall is the perfect time to wear these items, because they can stand alone and stand out. In the spring I usually resort to a lighter jacket or cardigan (most of the time, boring), and in the winter most statement pieces are covered up by the dreaded parka and the millions of layers it takes to keep me warm. Anyone else the same? During the fall though, the temperature and weather is usually just right to go sans parka and wear something heavier than a cardigan. 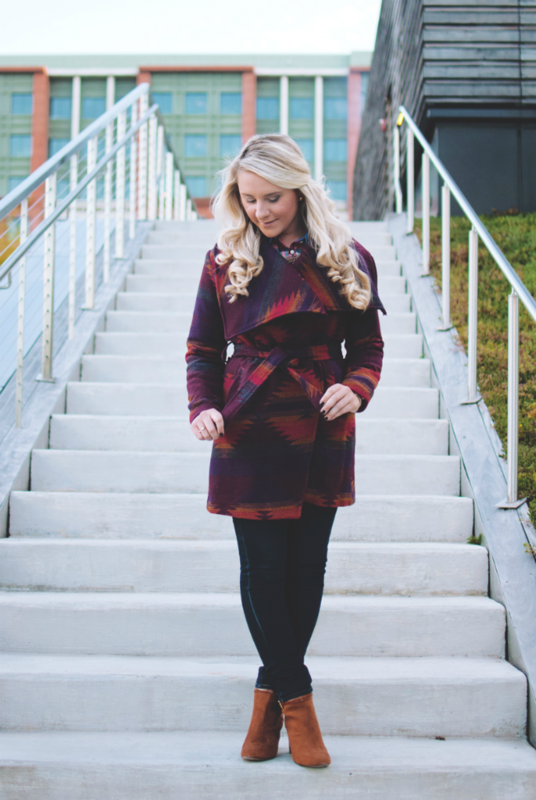 Like this amazing Steve Madden Blanket Wrap Coat from Nordstrom. I was instantly drawn to it because of the color. Anything plum purple... it's mine! I was worried that the online pictures could have distorted the true color of the coat. Basically, I was afraid I was going to get a bright red and yellow garment in the mail. Not the case at all! 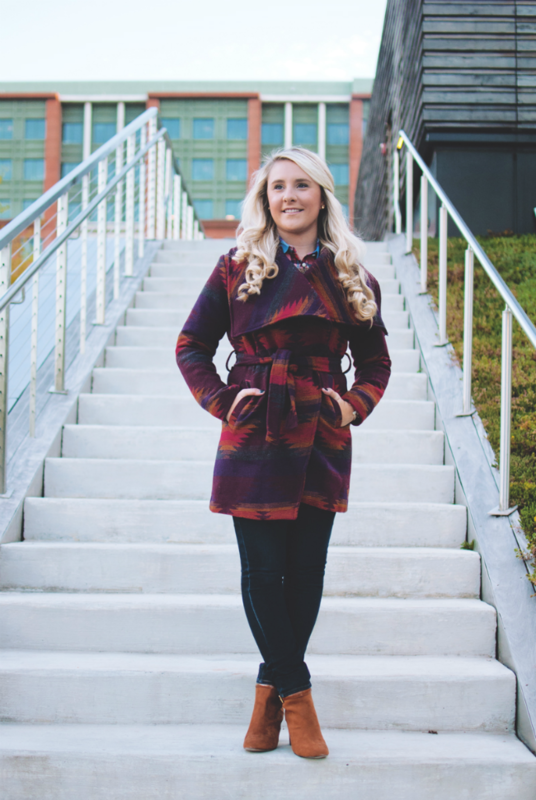 This particular coat is a little heavier than I had envisioned, but it made me love it that much more! I paired it over a basic button up and my go-to jeans. I can wear it with riding boots or loafers, depending on the weather, too. It is super comfortable and I just love the way it fits. I can tell that I'll be wearing this coat as much as I can this fall. 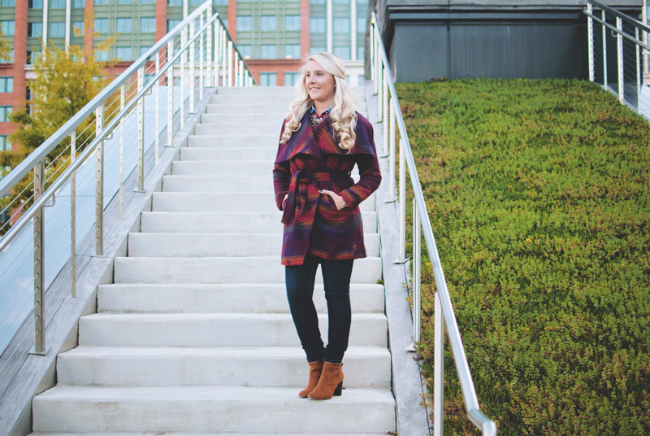 Nordstrom has a few other fall outerwear pieces that I've got my eye on, so I have linked them in the slider below. Just scroll through!! I love that jacket, Kristyn! I love when coats easily pull together an outfit. Have a great Wednesday! SUCH a beautiful coat, K! I love how you've styled it with those booties. So glad fall weather has actually arrived! Bring it on! Thanks Katie :) Me too!! Loving the cooler weather for sure! What an awesome coat, I love it! Nordstrom has so many awesome things for all the seasons! Me too! It's perfect for fall and I can't wait to wear it again soon!! !